After committing to a series, you always hope it will end in a satisfying way. Lauren DeStefano's The Chemical Garden Trilogy does just that. I was not a fan of Fever, the second novel, but know that the second novel in a trilogy can be slow because it is building for a grand finale. I was very satisfied by how Sever wraps everything up. This is the most likable that any of the characters have been: Cicely has matured, Linden shows some spine, and even Vaughn is a more well-rounded character. Plus, there is almost nothing about the bizarre South Carolina carnival that dominated too much of Fever. Rhine is not in a drug haze or ill in Sever, so she can be the strong heroine we want her to be. There are also a lot more plot twists and fun characters in this novel. One thing didn't work for me: Gabriel. While I have always found him to be a bit of a drag, there is nothing in Sever that would explain Rhine's devotion to him. I didn't really care if Rhine ever ended up with Gabriel, so was not invested in his storyline. 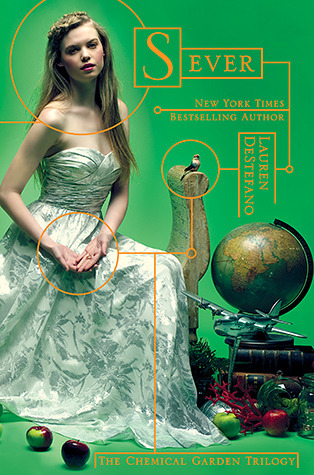 It's sad to end a series when you've enjoyed it, although I am eager to see what Lauren DeStefano comes up with next.